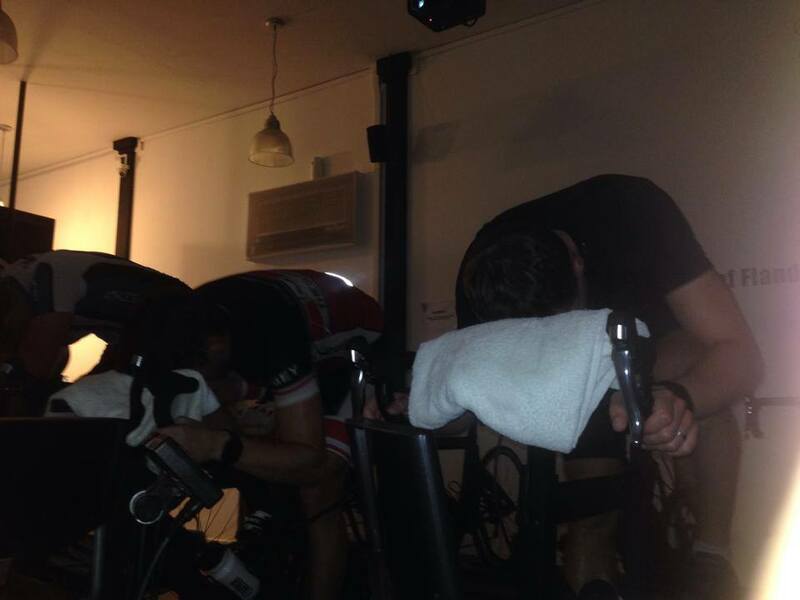 Sums up what Sufferfest is about I think…..
On Sat 25th January we witnessed something special in Athlete Lab as Jarno Lämsä and Antti Ruuska finished 10 Sufferfest videos in a row (12 hours in length all together); rightfully earning them the titles of Sufferlandrians. Bravo. 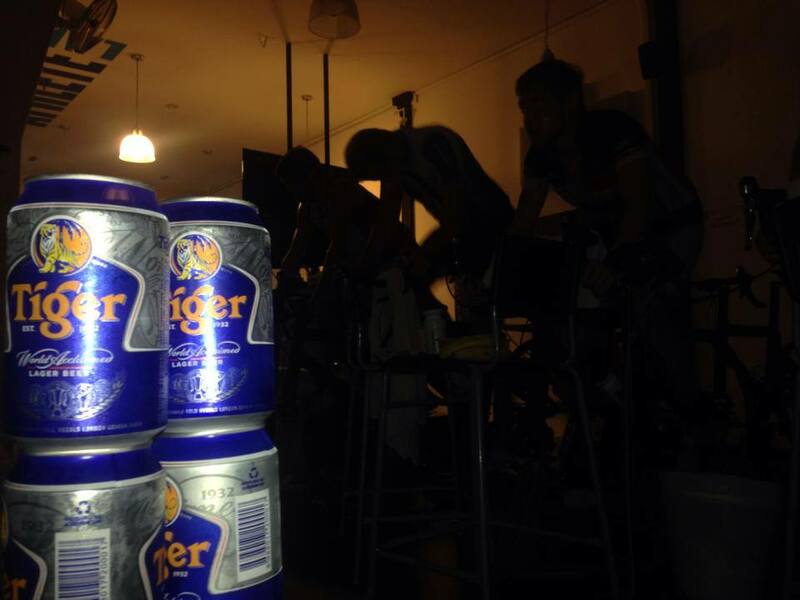 12 hours on the bike is a long time for any rider but I wanted to use this post to emphasis the difference in doing this challenge on a spin bike, or even in the fresh air & working through Sufferfest’s collection of titles. You should have seen the numbers pulled out by these guys even in the final hours! Incorporating real-life footage is nothing new these days but as I can testify these videos go that step further, with a more structured and focused workout regimen, which is basically a way of saying no escape. The degrading/motivational cues in tandem with footage of real race breaks – screams of ‘You are not going to let them get away with that?!? 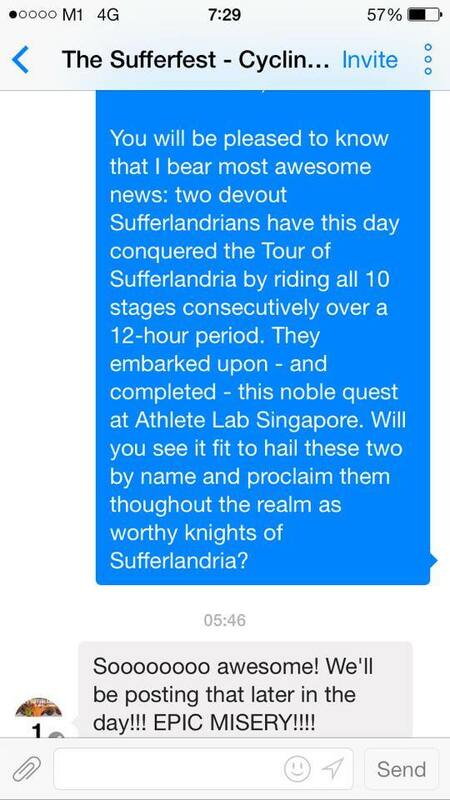 Are you a Sufferlandrian?? which some psychology study in a few years will prove scientific presses your ‘buttons’ – really does make you push harder. 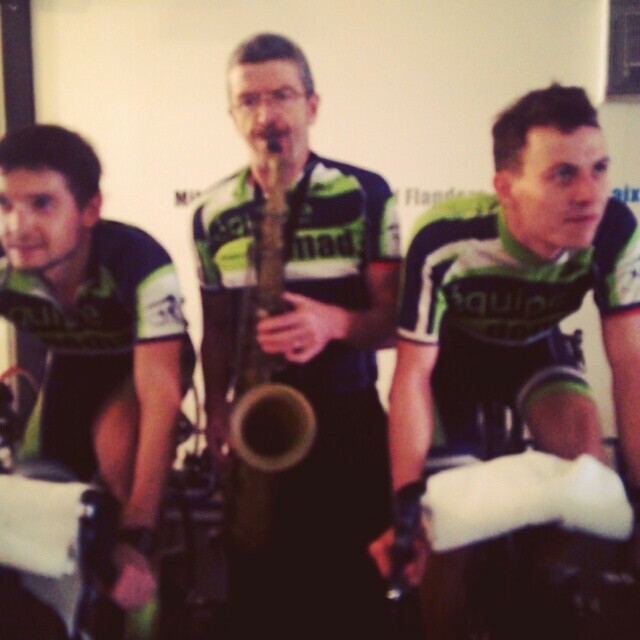 Its safe to say they did a pretty good at making you feel like you are in the peloton. There is a growing interest in indoor cycling circles on the Sufferfest videos mainly due to complaints on how hard the workouts are (this only helps), entertaining race footage & training commentary (you might even catch yourself giving a faint smile in the dungeon) a driving soundtrack that won’t put you to sleep and getting more out of a workout than the last week at 6am spin classes. Even classic music didn’t stop the burning…. But to be honest the numbers, figures become a long lost memory very quickly (or when you are dripping in sweat 30minutes later you are desperately trying to remember when it will all end) what does get burnt into your recall is the ‘Sufferscale’ of 1-10 perceived exertion; definition for 4 being ‘Pass the sunblock please’, 9 being ‘why wont this f**king end’ [that’s not an actual quote], 10 being ‘I give up just put me out of my misery’. Most videos at Sufferfest are an hour long, but not all ‘Hell hath no fury’ was a leg breaking 1:20mins, with 2x20mins full-on race pace intervals. This sneak preview of the ‘Blender’ shows a 1hr 40min, with an end segment of 3×4:00 TT sections…..just in case you had anything left in the tank. For our Finnish 12hour duo, none of their workouts could be classified as ‘moderate’ or ‘temp’, and I can assure you that there was no level of boredom as these videos require total focus – mainly so you know when your legs are going to be knifed again. For April Fools Day I would recommend other members of the Lab making sounds of an engine revving (thats the bit where you speed up in the videos) that will cause a bit of fear down their spines! So the duo took on a catalog of Sufferfest videos from 6am right through to 6pm; not even a lay in before the torture chamber. Unfortunately circumstances didn’t permit me to arrive until the ‘Fight Club’ session but from the look of their faces there has been much grunting determination in the 8 previous hours. 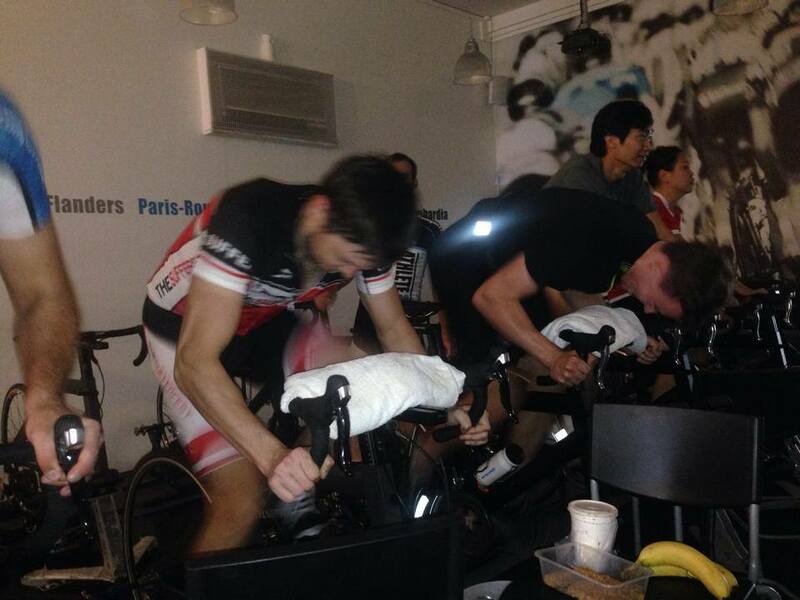 However no doubt much to the annoyance of the crew at Sufferfest I may even had seen a flicker of a smile & hope. Even after 8 hours the lads were head down & pumping out maximum effort every time the screen shouted ‘Attack!’, and much out of embarrassment I had to put my workout to maximum FTP effort for 4 hours just to feel welcome in any group photos! It was by no means a pleasant experience but with the help of cans & cans of 100plus & some home baked biscuits, my first viewing of the Sufferfest torturefest extracted huge training benefits – I crawled into the lab tonight and was shocked by the relative ease of my previous workout level. 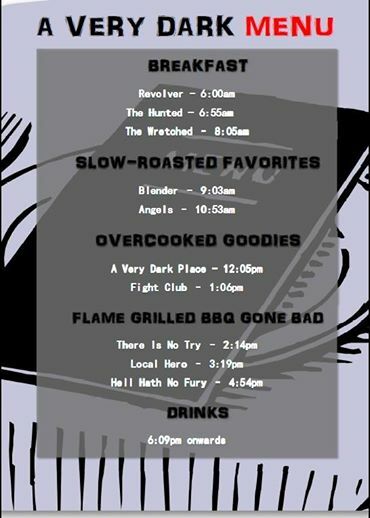 And that 16 hour challenge….well maybe there is a warm up for the Deca Ironman……………..